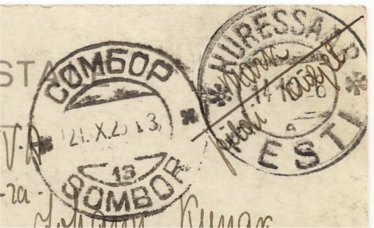 On November 19, 1918, The Estonian post opened the doors in the city hall of Kuressaare. 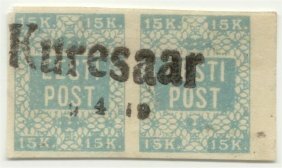 Also in Kuressaare the Estonian post started with provisional cancellations, type C1, place in single line and with capital first letter. In 1918-1919 is also the date added with another stamp, as in this cancellation. Kuressaare is the most important place of the island Saarema. 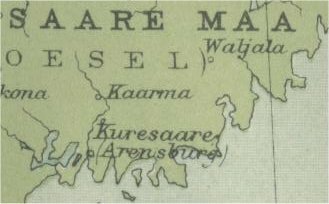 On this detail of map Times Atlas 1920: Kuressaare is indicated on the coast of Saarema, also the old name Arensburh is indicated..In the tsaristic time the place was indicated as Arensburg and a famous health resort. With the independence of Estonia the name sounds too much 'German', so the name changed in Kuresaare. The name 'Kurre-saare' was already existing: with this names the mainland-Estonians indicated the island. The islanders called their island 'Saare-ma' , that means 'Island-land'. The place name is 'KURESSAAR' from November 29, 1918, up to August 31, 1933. Then the spelling changed: from September 1, 1933, it is KURESSAARE. 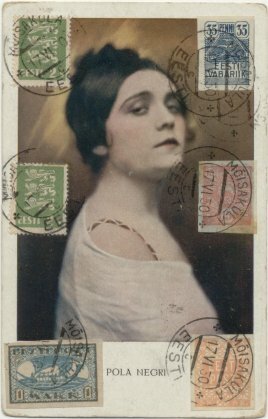 Card, sent from 'Kuressaar' in 1929. The postmark with the indication 'Kuressaar', resized 50 %. This type cancellation is a former Russian cancellation, Arabic numeral, and code letter 'A', used 1919-1932: type A3 (see above). Also is used another former Russian cancellation, but with two Maltese crosses between the circles: used with code letter 'b' (1920-1933): type A4. This nice card with a picture of the castle is sent from Kuressaare to Sombor in Yugoslavia (now Serbia). The postmark, resized 50 %. The same postmark as above. 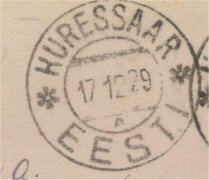 On this card is still -1932- the indication 'Kuressaar' used in the postmark. Here the othe side of the card, a Christmas card. 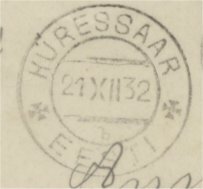 According EESTI the postmarks with indication KURESSAAR can have following indexletters: A, b, C and D. The cancellation has code letter 'b' and it is -according the Handbook EESTI type A4, a former Russian postmark with Maltese crosses between the rings. Normally this type has Arabic numerals, but here the month is in Roman numerals. I suppose because it is a very late use of this postmark. Card, 1940, the postmark not so clear, but codeletter 'A' in 1940: so type B4 according EESTI. 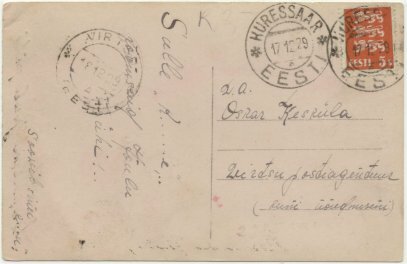 Card, sent from the postal agency in the castle of Kuressaare. The postal agency used ab own postmark -see below- and an additional postmark. On the other side - the card is used, but the handwritten message and address is very light and difficult to read-the postmark of the post-office in the castle, resized 50 %. 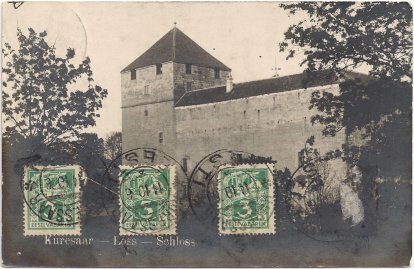 Between the circles of the postmark is indicated: KURESSAARE LOSS (= KURESSAARE CASTLE). This card from Mõisaküla. The post office is opened November 26, 1918. 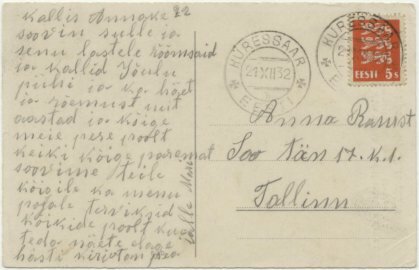 The first postmarks of Mõisaküla were provisional Estonian cancellations, 1918-1919. There are reported three different. After these were used the Estonian double circle postmarks, 1919-1944. 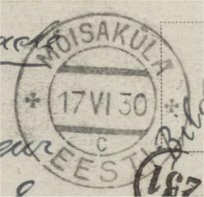 There are reported three postmarks of Mõisaküla in the period of independent Estonia . One postmark - double circular date-stamp of former Estonian type -during the German occupation is used 1942-1944. In independent Estonia are the three different postmarks: type 15A1 with serial letter A, type 15B4 with serial letter B, and type 15B1 with serial letter C.
On this card is used type with month in Roman numeral, EESTI between circles, so type 15B, and the subtype with two crosses, type 15B1. The stamps are on the picture-side of the card, but also -a more clear- additional postmark is places on the address-side. Mõisaküla is founded on the area of Abja manor (Mõisa = estate) and is located in south-west Estonia, near the Latvian border. It is a urban municipality, but it is the smallest city with this status ("linn"). With the treaty of Tartu (2 February 1920) Russia recognized the independence of Estonia. The border was somewhat east of the Narva river. Narva, near the new border, part from the map in the Times Atlas 1922. In Narva also the old Russian postmarks are reused. The easiest distinction: the date of the month is in Arabic numerals. 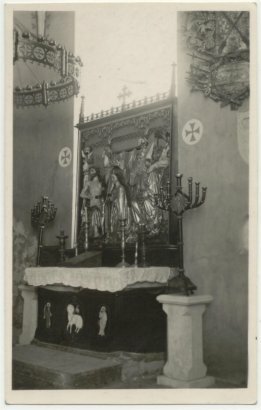 Card, sent 29-5-1924. "The postmark, resized 50 %. Reuse of the old Russian postmarks was done in the beginning also locally. In the handbook EESTI there are two types provisional postmarks: without EESTI below (type 14F1) and with EESTI (type 14F2). 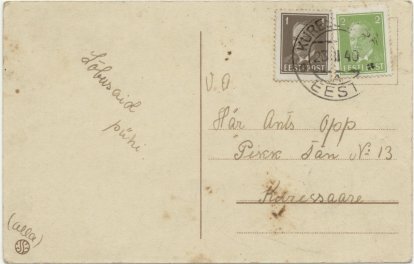 In Narva only type 14F1, the postmark on this card, is used. This type has also bars. 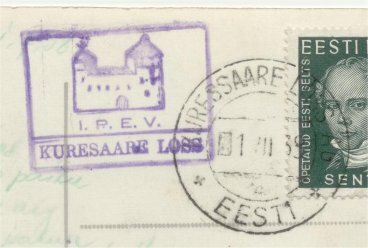 In Narva this postmark has clear dark bars (1919-1922, type 14F1a) or more light bars (1923-1928, type 14F1b). The postoffice is opened 19 November 1918 and there are recorded three earlier provisional cancellations, used in 1918: double circle Russian datestamps with Russian place name (serial **b and **z, type 14A7) and a single line postmark (capital first letter, type 14D1). Another cover with the same postmark, date 19. 8. 1920, but the bars are more filled, darker. The cover is of a textile factory in Narva, 'former Baron A.L. von Stieglitz'. After the death of his father in 1843, Baron Alexander von Stieglitz (1814-1884) took control about Stieglitz and Co.: paper factory in Ekaterinenhof and textile factories in Narva. In 1860 he liquidated all his commercial enterprises: with the start of the State Bank of the Russian Empire, 31 May 1860, Stieglitz became its first governor and held this position to 1866. After this period he was mainly philanthropist. Stieglitz is buried in Ivangorod, part then of the city of Narva, at the Church of the Holy Trinity. Card with the new Estonian postmark: month in Roman numeral, serial letter B (?). 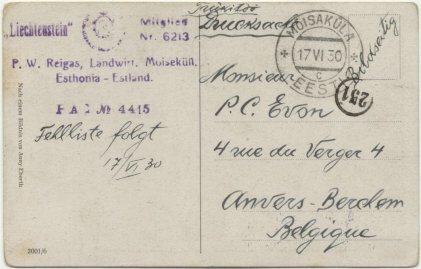 Postal stationary, sent from Narva to Germany, dated 4 May 1928. Between 1-2-1925 and 1-1-1928 the rate was 12 marka. Between 1-1-1928 and 11-1935 the rate was 12 senti: additional postage stamp necessary on this card. Due to the rapid inflation a new currency was necessary in 1928: rate 100 Mark = 1 Kroon. From 1-1-1928: 1 Kroon = 100 Senti. The new Estonian postmark, month in Roman numeral, serial letter E: type 15B4. In 1762 the Swedish settlement Rågervik is by Imperial Russia changed in Baltiyskiy Port, Baltic Port. In Estonia the name became Baltiski an that we see in the first postmarks of the Estonian Republic. In 1933 the name Baltiski is changed into Paldiski. The post-office of Baltiski is opened November 22, 1918 and closed August31, 1933. On September 1, 1933, the post-office is re-opened as Paldiski. 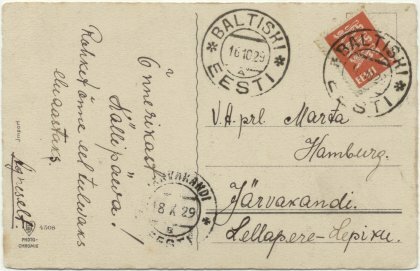 Card, sent from Baltiski to Jarvakandi. The postmark of Baltiski has the month in Arabic numeral, so it is according EESTI type 15A. The postmarks of this type are former Russian date-stamps, centrally re-engraved. BALTISKI type 15A3 with serial A, and type 15B4 with serial B. Type 15B: Estonian date-stamps, month in Roman numeral, EESTI between circles, subtype 15B4 is with Maltese crosses. PALDISKI type 15B4 with serial A, type 15B4 with serial B (diameter 29,5 mm) and type 15B4 also with serial B (but diameter 29 mm). With the start of the postoffice provisional cancellatens are used in Baltiski: 7 different postmarks. Baltiski is located in the north-west of Estonia on the coast. 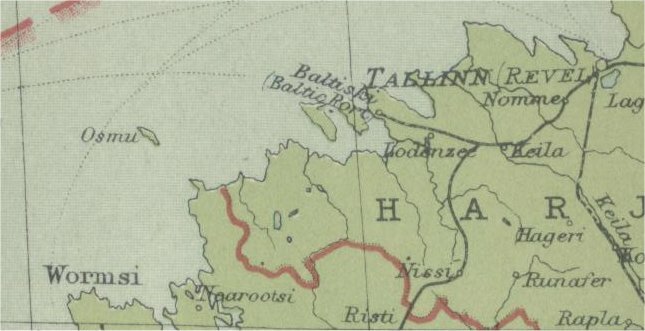 Detail from the map of the Baltic in the Times Atlas 1922. 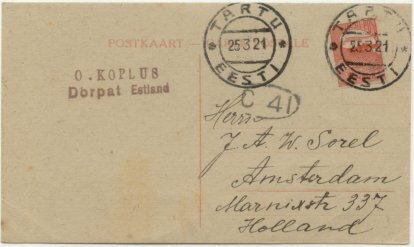 This card is sent fromTaru to Amsterdam, the Netherlands, in 1921. The postmark has the month in Arabic numerals: a former Russian date-stamp, type 15A. An indexletter is not used in this very early postmark. 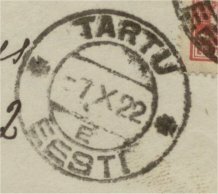 Reported postmarks without indexletter: type A2 as here is used (five-pointet starlets, in EESTI postmark number 1 of Tartu) or A4 (Maltese crosses, illustration in EESTI). 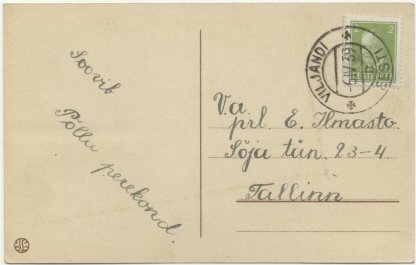 This letter is sent from Tartu to Viljandi, 1922. 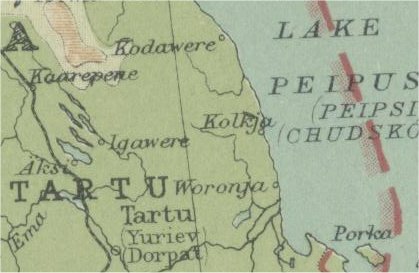 On this detail of the map above -Times Atlas 1922- is indicated Tartu and the county TARTU. Tartu is indicated with the different names: Tartu (Estonian), Dorpat (German name) and Yurew (Russian name). 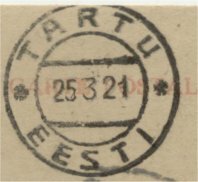 The post office of Tartu is opened November 22, 1918. This postmark -7 X 22 with indexletter E is type 15B4: month in Roman numeral, Maltese crosses. 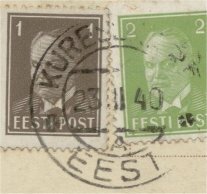 According EESTI there are four different postmarks with indexletter E, all type B4. 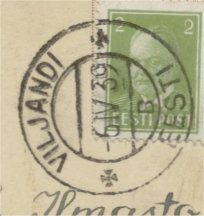 On the backside is used an arrival postmark of Viljandi: see below. 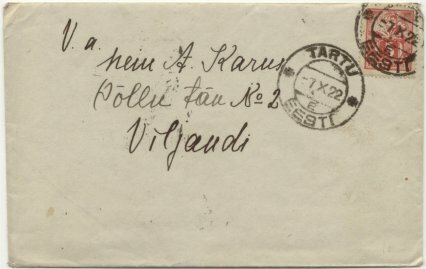 This is an arrival postmark of Viljandi on a cover from Tartu (see above). The month is in Arabic numerals, so it is type 15A, a former Russian date-stamp. According EESTi is used in Viljani type A2, with indexletters a, A and b. Here the indexletter is the cyrillic letter Б. 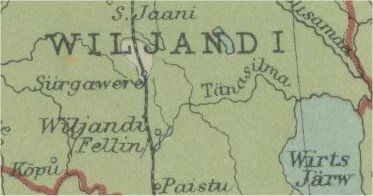 On this detail of the map above -Times Atlas 1922- is Viljandi indicated in southern Estonia, also the old name Fellin. Viljandi -on the map WILJANDI- is also the name of the county. Now Estonia is divided in 15 counties and Viljandi is also one of the present counties. The postmark, resized 50 %. 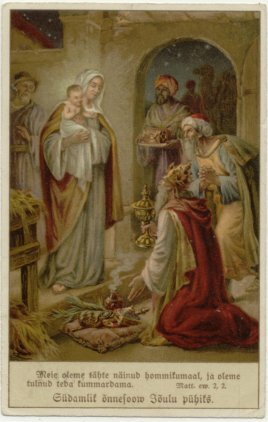 The piciture side of the card: "Häid Pühi", Merry Chrismas. Something strange, when we look to the date of the postmark. 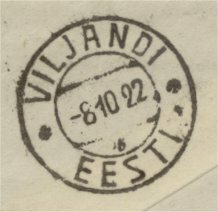 The first two postmarks of Viljandi use the old orthography WILJANDI, the next ten postmarks have VILJANDI between the circles. This postmark with indexletter B is type B4: month in Roman numerals, EESTI between the circles and Maltese crosses between the circles. There are three different postmarks with indexletter B, all type B4. In the numbering of EESTI: number 5 and 7 have diameter 29,5 and number 6 has diameter 29. The name АРЕНСБУРГЪ [ARENSBURG], in the tsaristic period the indication for the Estonian Kuressaare. The EESTI-handbook of Hurt and Ojaste is the handbook about Estonia. EESTI : Estonia : philately & postal history handbook catalugue / Vambola Hurt, Elmar Ojaste. - 1986 . - 767 p.. - With supplement 1988. Supplement II: in Eesti 1988 ; nr. 32. - p. 187-207. Supplement III: in Eesti 1990 ; nr. 33-34. - p. 175-214.